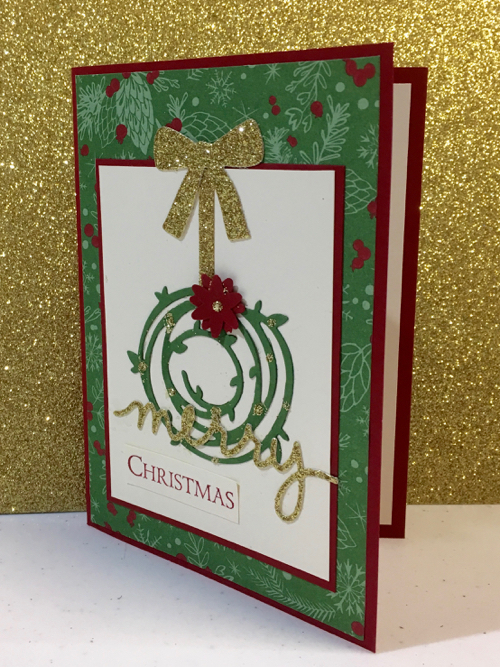 I do like to have my Christmas cards ready in time for Christmas so I usually start my Christmas Card Stamp A Stack classes in February. Unfortunately it seemed that all Chrsitmas inspiration left me so I turned to trusty Pinterest for some inspiration and found just what I was looking for. A Stamp A Stack card needs to be interesting yet fairly simple to create, and I think, should include some stamping, some cutting and some layering. I used the very versatile Swirly Scribbles Thinlits set for the wreath, Wonderful Wreath Framelits for the bow and flower, Christmas Greeting Thinlits for the "Merry", some paper from the gorgeous This Christmas Specialty Designer Series Paper, Cherry Cobbler and Whisper White card, and Gold Glimmer paper. The "Christmas" word stamp is one I use often and comes from the Holly Jolly Greetings stamp set in the Annual Catalogue. You can see the small dots of gold glitter on the wreath - they were made by putting small dots of adhesive on the wreath and sprinkling gold glitter over the top. Be sure to let it dry properly before picking up the card or your dots will droop! Don't ask me how I know lol. I love the traditional colours in this card and the patterns in the paper add interest without taking up time. I cannot finish this post without offering each of you a fabulous opportunity to join Stampin' Up! during Sale-A-Bration. You get all the benefits of being a member of the SU family plus during SAB you can choose 2 additional free stamp sets of your choice. Depending on your choice this can be well over $100 of stamps for free and that is in addition to all the heavily discounted items you choose for your Starter Kit. Do you like what you see and think you'd like to earn some extra income from stamping? If you are looking for a hobby, a part or full time job, working from home and at your own pace, AND you love craft, then you should consider doing what I do. It is fun and rewarding. See more information on my website or contact me with questions you may have.